Competitive salary along with generous state benefits package is available including PTO, medical, dental and disability insurance, as well as retirement. Professional liability insurance under TTUHSC umbrella plan; incentive augmentation bonus (quarterly, yearly, based on clinical performance/research/teaching/service). Additional benefits include professional development allowance for continuing education, memberships, licenses and other applicable expenses. Lubbock is a family friendly and rapidly growing community with a mild climate and low cost of living. Lubbock and the surrounding communities comprise a population of 311K. With multiple universities and professional schools, there are diverse entertainment and leisure opportunities to accommodate any tastes. 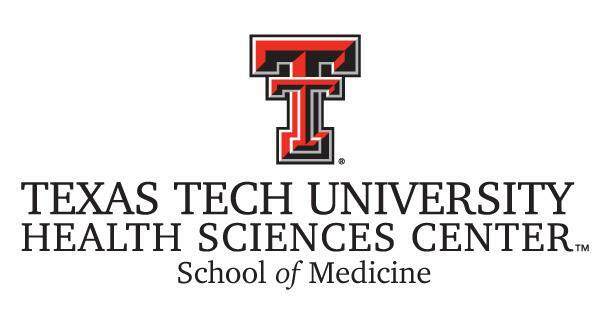 Welcome to the Texas Tech University Health Sciences Center, where a dedication to education, patient care and research has made an impact on the health of West Texas and beyond for almost 50 years. We meet the health care needs of more than 2.5 million people who live throughout a vast 108-county stretching from the Texas Panhandle south to the Permian Basin and west into Eastern New Mexico. We have established ourselves as a leader in education and patient care and are building a top-ranked research environment with significant studies under way in areas such as aging, cancer, reproduction, genetic diseases and rural health. Lubbock, Texas is a city in and the county seat of Lubbock County, Texas. The city is located in the northwestern part of the state. The Lubbock metro population is 318,679 with a catchment area of over 1.2 million. Known as the “Hub City” of West Texas, our diverse economy is based on manufacturing, agriculture, wholesale and retail trade services, as well as government, education and health care. Lubbock is the only city in the nation with a comprehensive university, a health sciences center, an agriculture college and a law school in one location, making Texas Tech University the second largest contiguous university campus in the United States. Schools The Lubbock area is home to more than 54,000 college students and nearly 13,200 college graduates annually, a number that continues to grow each year. Lubbock is home to a variety of public and private schools. See school rankings here. Weather Lubbock has a mild climate with predominately warm days and cool nights throughout the year. Summers are hot with relatively low humidity, while winters are typically sunny and mild with infrequent extended cold periods. Lubbock sits 3,200 feet above sea level, making it comfortable year round. Cost of Living The cost of living in the Lubbock area is far below the national average. According to the Council for Community and Economic Research, Lubbock’s overall cost of living index is 89.4 percent. Lubbock ranked No. 61 out of 268 urban areas in the nation and No. 12 out of 30 urban areas in the state of Texas for lowest cost of living. Culture & Attractions The “Hub City” has long been recognized as a birthplace for original music, producing greats like Buddy Holly & The Crickets, Waylon Jennings, Mac Davis, Roy Orbison, Tanya Tucker and Natalie Maines of the Dixie Chicks. Today, Lubbock continues to launch some of the best musical talent and is home to a diverse music scene ranging from Classical and Country & Western to Bluegrass, Tejano and Rock ‘n’ Roll. Lubbock’s vibrant art scene includes festivals, shows, performances and exhibitions throughout the year. From art galleries to music to dance, Lubbock’s art culture is thriving. In addition, the Lubbock area hosts numerous special events each year, including the National Cowboy Symposium & Celebration, Texas Tech Carol of Lights, Pumpkin Trail, The Nutcracker presented by Ballet Lubbock, Downtown Farmer's Market, Lubbock Moonlight Musicals, Texas Tech sporting events, and many more. The wide open space and temperate weather of West Texas also provides the perfect environment for thriving vineyards. From award-winning wine to stunning architecture, you can indulge all your senses during a wine tour of the Llano Estacado Winery, CapRock Winery, McPherson Cellars, and Pheasant Ridge Winery.